Iran Now a "Nuclear State"
“Iran is now a ‘nuclear state’, President Mahmoud Ahmadinejad announced this morning,” reports the London Daily Mail. 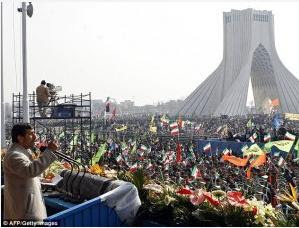 “He spoke as tens of thousands of people took to the streets in Tehran to mark the 31st anniversary of the Islamic revolution. There are fears of violence as opposition and pro-government supporters are expected to meet at rallies in a show of popular strength unmatched since the revolution itself. Today Ahmadinejad told scores of cheering Iranians that the Islamic Republic is capable of producing weapons-grade uranium…. He spoke as tens of thousands of people took to the streets in Tehran to mark the 31st anniversary of the Islamic revolution. There are fears of violence as opposition and pro-government supporters are expected to meet at rallies in a show of popular strength unmatched since the revolution itself. Today Ahmadinejad told scores of cheering Iranians that the Islamic Republic is capable of producing weapons-grade uranium…. How will the leaders of the free world respond to this news? Will they take decisive action to stop Iran from building or acquiring nuclear weapons before it is too late? Or will they sleep through the crisis and be blindsided by an evil they don’t take seriously enough? How will the leaders of the Church — and followers of Jesus Christ around the world — respond to this news? Will they take decisive action to reach every person in the epicenter, including everyone in Iran, with the gospel? Will they fast and pray for the peace of Jerusalem? Will they find real and practical ways to show Israelis unconditional love and unwavering support as they face this rising threat to their very existence? Or will we sleep through the crisis and be blindsided by an evil we don’t take seriously enough?